The overhead bridge linked Church Street and Winchester Avenue above the Seaboard Railroad tracks. The business in the center of this picture is Henderson Roller Mill. 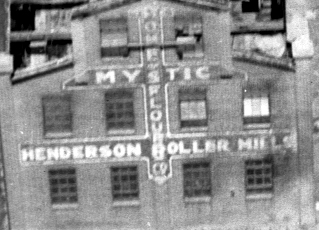 An enlargement allows us to read the sign on the building, “Henderson Roller Mill Co. – Home of Mystic Flour.” Apparently, the grain cars on the right delivered the raw material (wheat) for processing and the finished product (flour) was loaded back onto rail cars to the left for distribution across the country – a fairly sophisticated operation. 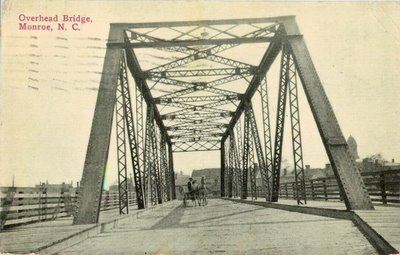 Another view of the old overhead bridge is from a postcard dated 1913 (Source: Looking Back at Monroe's History, by Virginia A. S. Kendrick). Some of the concrete supporting pillars are still standing alongside the railroad tracks today but the overhead bridge was torn down in the 1950’s when the new Skyway Bridge was opened for traffic. How well I remember the Overhead Bridge! I was terrified of it and did not want to go over it. There were quite a few wrecks at the sharp curve on it. My dad used to walk over that bridge for many years going to and from his work. It was a great day for me when Skyway Drive was opened and the bridge was torn down. Ditto to what you have to say about being terrified of that bridge, Marizell!! I, too, had great fears that continued well into my adulthood. I still hate to go over bridges, and the rickety condition of that bridge also left me with a fear of going under bridges, because I was afraid they would cave in on me! Sounds silly, I know, but it's true!! 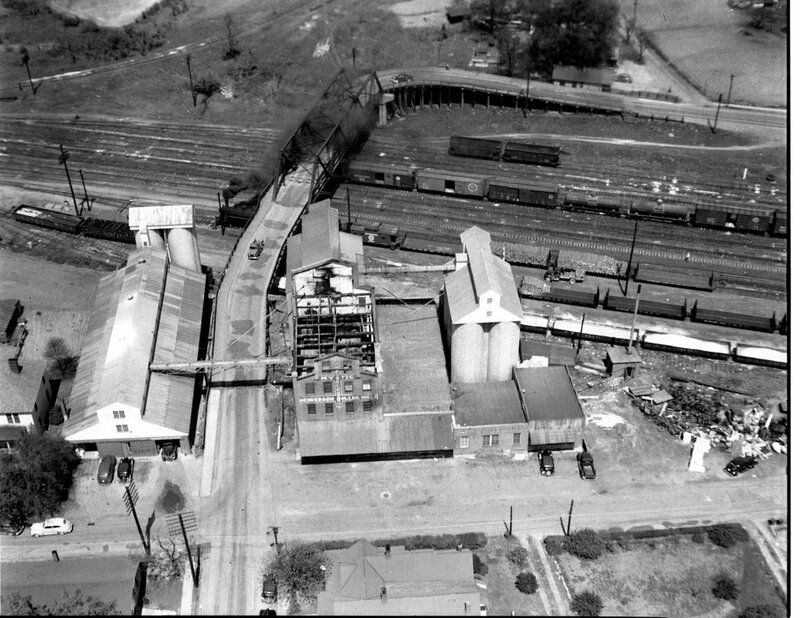 The photo of Hendereson Roller Mill was probably made for an insurance company. If you will notice the roof is gone and you can see down in the building. I remember at the time of the fire the weather was very cold and the firemen had a hard time fighting this fire because of freezing weather. About the Over Head Bridge, I beleive this is the best picture of that I have of that bridge.